Jupiter has at least 79 moons. Except for eight of them, Jupiter's moons are asteroids or comets caught by the planet's strong gravity. They're tiny, oddly-shaped bodies whose orbits are scattered around Jupiter, millions of kilometers away from the planet. Astronomers announced the discovery of twelve new moons in July 2018. The inner satellites (Amalthea group) orbit close to the planet. The four moons in this group are irregular in shape and they are small. Amalthea, the largest, is less than 250 km (155 mi) across. 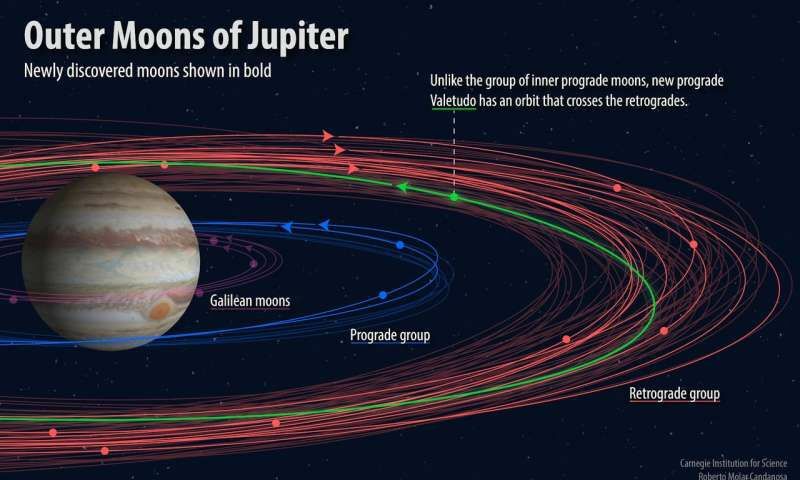 These moons eject material that becomes part of Jupiter's faint rings. Galileo discovered the four large moons in 1610. The Galilean moons are too faint to see with the unaided eye. Galileo saw them in a telescope, but you should be able to see them through binoculars on a clear night. They look like tiny dots of light either side of Jupiter. 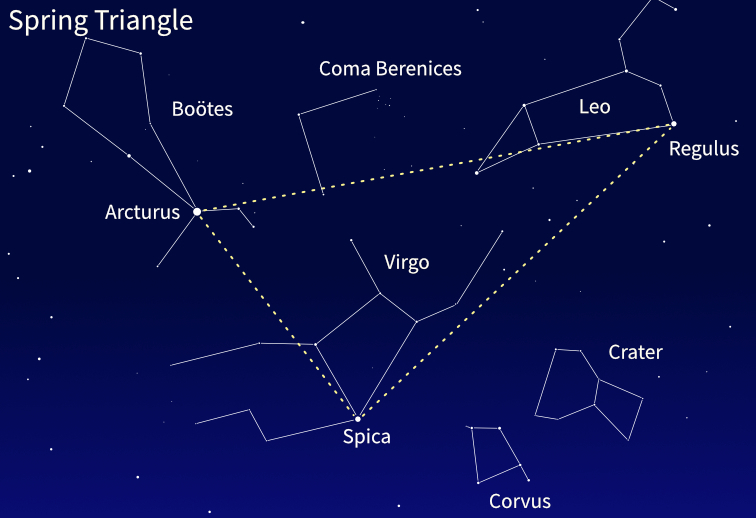 You can't always see four, because some may be passing in front of Jupiter, or behind it. They are named Io, Europa, Ganymede and Callisto, lovers of the Greek god Zeus. Jupiter is the Roman name for Zeus. The Galilean moons have enough mass for gravity to pull them together into a roundish shape. What if, instead of orbiting Jupiter, these four moons orbited the Sun? Since Ganymede is larger than Mercury, it would be a planet. 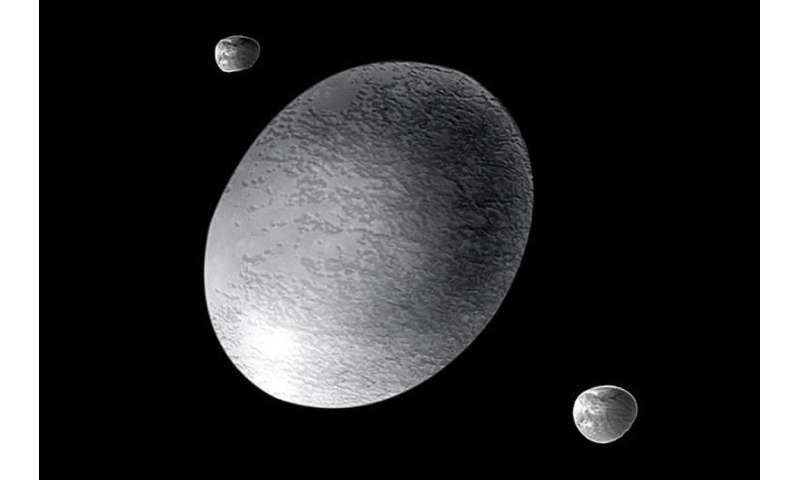 The others are smaller than Mercury, but larger than Pluto. They would be dwarf planets. 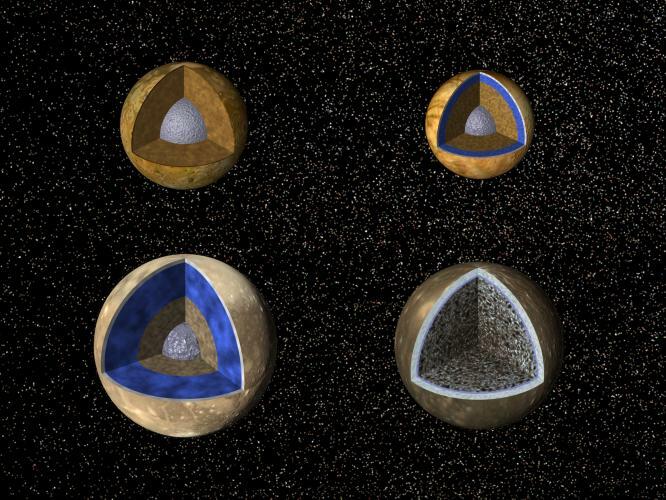 The Galilean moons have internal layers, like planets do. Earth, for example, has an iron core (center), surrounded by a mantle and a thin outer layer called the crust. Callisto doesn't have an iron core, but the other three Galilean moons do. All four of them have some layers. Click to see how the Galilean moons may be layered. Remember to click the back arrow on your browser to come back to the story. Io is only slightly bigger than our Moon, and it orbits Jupiter at about the same distance as the Moon orbits Earth. But they're very different! Io has over 400 volcanoes. Io also gets around Jupiter in less than two days, instead of the 29 days our Moon takes to orbit Earth. The gravity of both Jupiter and some of the other moons pulls on Io so that it gets stretched and squeezed. This heats it inside – we call this tidal heating. It was a big surprise when Voyager 1 sent home an image of a volcano erupting on Io. Io is the moon that looks like a pizza in some pictures. Click to see a picture of Io. Remember to click the back arrow on your browser to come back to the story. Europa is covered in ice, and is one of the smoothest objects in the Solar System. Europa may be covered in ice, but it also has some tidal heating. It's heated less than Io, but there's enough heating for a deep liquid ocean under the ice. Scientists think that Europa and Ganymede would be good places to look for life. Ganymede is the biggest moon in the Solar System. Like Earth, Ganymede has a liquid iron core, and is the only moon in the Solar System with a magnetic field. Earth's surface is always changing because of water and weather, and because it's geologically active. This means that we have earthquakes and volcanoes, and that the crust is broken into large slowly-moving plates. Ganymede doesn't have any of these, so its surface is made of ancient rock. Some of the terrain is maybe four billion years old. That's twice the average age of the crust under Earth's continents. Callisto has little or no internal activity, but it's the most heavily cratered satellite in the Solar System. Callisto's interior was never very active. Its surface features were caused by impacts. The largest crater is called Valhalla, which is 360 km (225 miles) across. Although our Moon's surface is a record of the history of the inner Solar System, Callisto's surface is probably the oldest in the Solar System.